This 'Equalize Trad Anchors' article is part of the e-book - Trad Climbing Basics. Let's assume you've got two incredibly good pieces of gear or two bolts at the anchor. 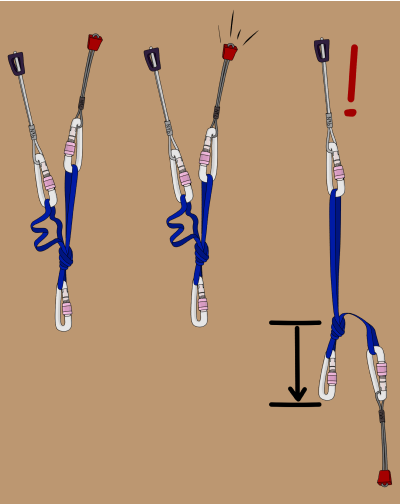 The easiest way to equalize them together is by using a long (120cm or 240cm) sling, or a cordelette (a loop of 7 or 8mm cord). Clip the sling or cordelette to both pieces of gear, using screwgate carabiners. 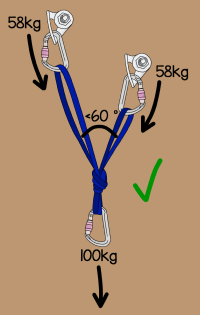 Pull it down in the middle so both strands of sling are equal. Tie an overhand knot in it. This creates a central point. Clip a screwgate carabiner into the central point. 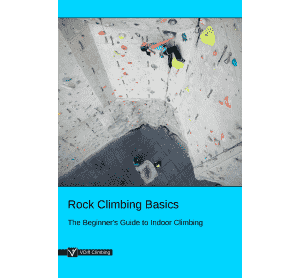 1) Each piece of gear only takes around 50% of the total weight of the belay. 2) The anchor is set up for the direction that the 'pull' will come from. 3) If one piece of gear was to fail, the other would not be shock loaded. These criteria are explained below. In theory, if you have two pieces of gear with 100kg hanging from them, each will take 50kg, right? Unfortunately not. 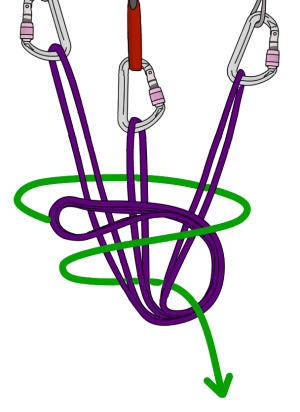 This depends on the angle the sling makes just above the overhand knot (the V-angle). The smaller the V-angle, the smaller the force on each piece of gear. You don't need to know how to calculate these numbers, but an angle of anything up to 60 degrees is acceptable. At this point, 58% of the total weight of the belay (the weight of both climbers) will go onto each piece. This is good. At 90 degrees, 71% of the force will go onto each piece. This isn't too good. At 120 degrees, each piece of gear takes 100% of the force! Never equalize gear with such a large angle. 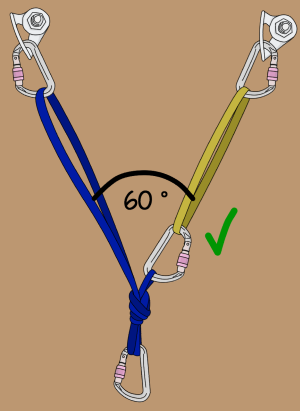 You can decrease the V-angle by using a longer sling or cordelette. If you don't have one, you can extend a piece with a short sling. Your gear needs to be equalized together in the 'direction of pull'. This is the direction that it would be weighted if your partner falls. If you've climbed straight up to an anchor and will be standing or sitting directly below it, this will be straight down. But if you've traversed in to a ledge and the rope is running off to the side, the pull will be in that direction. You'll need to place and equalize the gear to suit that. When you're setting the anchor up, think about the direction that the pull will be in. Tie your overhand knot accordingly, then test it by pulling hard in that direction. Are both strands of the sling taking the weight? If one is slack, then adjust your knot accordingly. Imagine hanging a heavy shopping bag from the coat rack in your hallway. If you place it there gently, the coat rack might strain a bit, but it'll hold. Now imagine extending that shopping bag with a piece of string. Hold it up high, then drop it. What happens? The increased force will likely break either the coat rack or the shopping bag, dumping your shopping in an untidy pile of broken eggs and plasterboard. This principle is exactly the same at a belay. 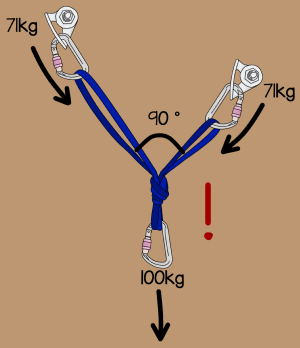 If one piece fails and the anchor isn't equalized correctly, all the weight of you and your partner will 'fall' onto the other piece, shock loading it. The extra force caused by shock-loading could pull out or break the remaining piece. 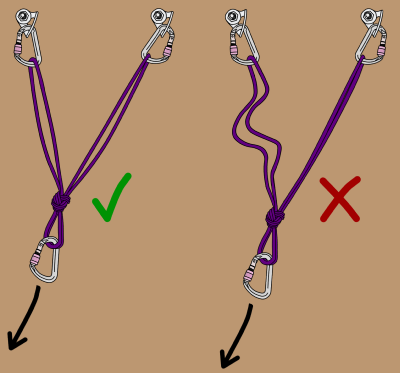 When you tie an overhand knot in your sling/ cordelette at the anchor, each piece becomes independent. This means that if any piece failed, there would be no movement or shock loading. 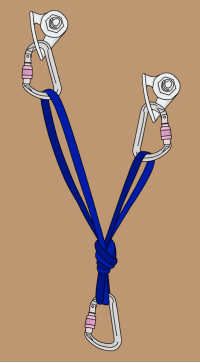 The previous example explained how to equalize an anchor with only two pieces of gear. This is fine if both pieces of gear are absolutely bomber (such as a new bolt or a sling around a big, sturdy tree). 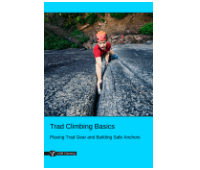 However, in most cases you'll be building trad anchors out of regular trad gear – nuts, hexes and cams. These are not as strong as bolts or massive trees, so you'll need to use more of them. 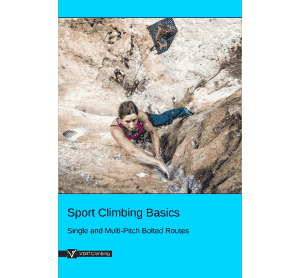 If you're not sure how many pieces of gear to use, see The 6 Point Rule. To equalize three pieces of gear, simply use a longer sling or cordelette. Pull two loops down and tie one big overhand knot in it. Then clip a screwgate through all three loops. You may need to fiddle with the knot slightly to get all strands to pull equally tight – often the middle one can go a little slack as you tie it. 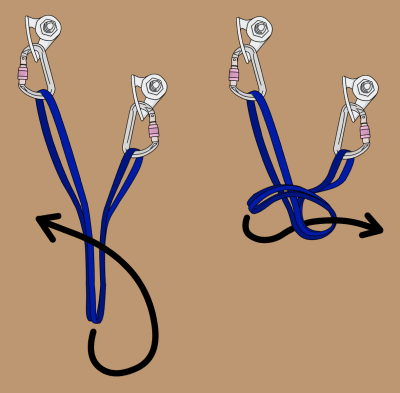 If you have two pieces of gear close together but the other one far away, it can help to use two slings. First, use one sling to equalize the two pieces which are close together. 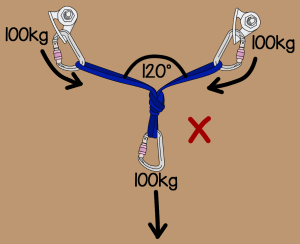 Next, equalize the central point of that with the third piece of gear using another sling. You may need more than three pieces of gear to make a secure anchor. Use the same method to equalize as many pieces together as you need. 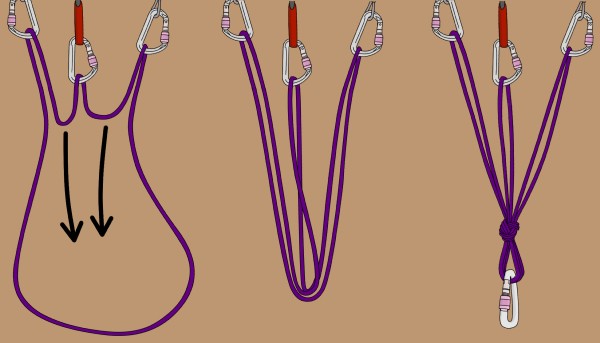 If you don't have enough slings, you can use the rope as part of the anchor (this is explained in the next article). If equalizing the anchor with a cordelette, it is typically better to create the central point at head to chest level. This provides a convenient workstation to attach yourself and belay your partner from. The following methods describe a few ways to adjust the height of the central point. One or more strands can be doubled up. The double loops don’t stretch as much, so they may give the higher piece more than it’s share of the load. Consider this when equalizing the pieces together. Tie an overhand in the cordelette to shorten it. Tie a figure 8 instead of an overhand at the central point. Or wrap the cord around itself one more time to create a figure 9. When using any of these methods to adjust the height of the central point, make sure your V-angle does not exceed 90 degrees. 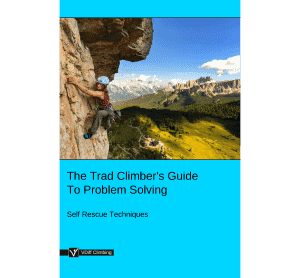 If you would prefer to use a cordelette to equalize the anchor (rather than the rope), but it isn’t long enough, try extending the furthest away piece with a sling. Alternatively, unfasten the double-fisherman’s bend and tie a figure-8 loop in each end of the cordelette. Clip the ends into the furthest away pieces and equalize with an overhand knot. The disadvantages of this setup are a reduced strength on the outer pieces (one strand of cordelette is weaker than two) and there is no top shelf.